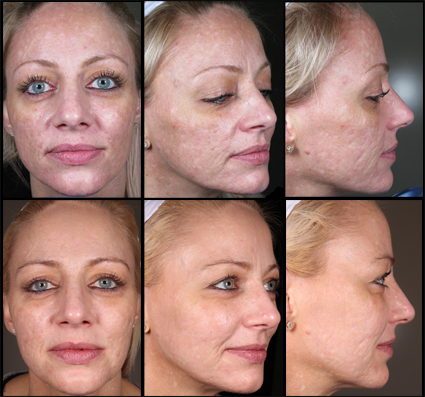 An example of acne scarring: The top row shows the impact of acne scarring before treatment at the Dermatology Institute of Victoria. The second row shows the change in the appearance of scars after a treatment plan performed at the Dermatology Institute of Victoria. Treatment of scarring can be very complex and requires an experienced professional. This is because scars manifest in different ways on different people and different types of scars create different issues. Scars can impact the skin by: causing changes in the colour and texture of the skin’s surface, volume changes may occur below the surface due to their impact on the skin's support structure, an example being the pitted appearance often associated with acne scarring. Also as we age and our skin loses its flexibility the effects of muscle movement pulling at our skin can cause scars to become more apparent. Treatment of all scars, but in particular acne scars may require more than one treatment session and more than one treatment type, highlighting the importance of consulting an experienced professional to ensure the best treatment plan can be put in place for you. Assoc Prof Greg Goodman is the most widely published Dermatologist in the world on this subject. Click here to go to our blog and read an interview with him.